THE SHE-DEVIL WITH A SWORD IS QUEEN OF HYRKANIA! LONG MAY SHE REIGN! Dragan The Magnificent marches his massive Zamoran army to do battle with Sonja's puny Hyrkanian forces. Any other monarch would retreat in cowardly fear. 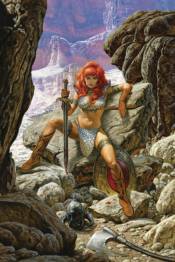 But Sonja will rely on the lessons she learned at THE COURT OF THE KHITAI, and empty her nephew Kryon's BROTHERS OF MISFORTUNE� The epic ongoing continues, by MARK RUSSELL (The Flintstones, The Wonder Twins) and MIRKO COLAK (Conan).